Back cover blurb: To everyone who knows her now, Zoe Maisey - child genius, musical sensation - is perfect. Yet several years ago Zoe caused the death of three teenagers. She served her time, and now she's free. Her story begins with her giving the performance of her life. By midnight, her mother is dead. The Perfect Girl is an intricate exploration into the mind of a teenager burdened by brilliance, and a past that she cannot leave behind. Zoe Maisey is a victim of her own success. A child prodigy who won a musical scholarship to an exclusive private school, she has the perfect life. Except those whose parents are paying for their children to attend Zoe's school look down their nose at her, and bully her. She is in their eyes not good enough to be there. Desperate to be liked, Zoe manages to befriend one of the most popular boys in the school - the only problem is, his sister is one of Zoe's main tormentors. Zoe thinks that she has eveything under control, until one night when a single mistake turns Zoe's life upside down. We pick up the story several years later, Zoe is at a concert with her step Brother, Lucas, having been recently released from a young offenders institution. But as she begins to play, she realises that something is seriously wrong. Will she ever be able to escape her past? Zoe and her Mother flee the concert, leaving Lucas and Zoe's step father Chris behind. Zoe knows that there will be a confrontation later that she will barely be able to stand, so she busies herself with looking after her baby Step Sister Grace. Lying in Grace's room, cuddling her sister and stroking Grace's baby smooth skin and watching her calm demeanor, convinces Zoe that everything will be okay. Hours later her Mother is dead, and Zoe is thrown into turmoil all over again. I can't say anymore without giving too much of this intense and brilliantly written page turner away. Gilly Macmillan is a seriously underrated talent as far as I am concerned and I cannot wait to read her next offering. 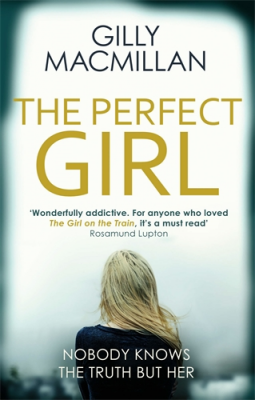 The Perfect Girl is available from 22 September 2016. You can pre-order it from Amazon online. Thank You to the publishers who approved my request via netgalley in exchange for an honest review.